This entry was posted in Uncategorized and tagged announcements, new release, promo, Sarah Madison, The Boys of Summer by Sarah Madison. Bookmark the permalink. 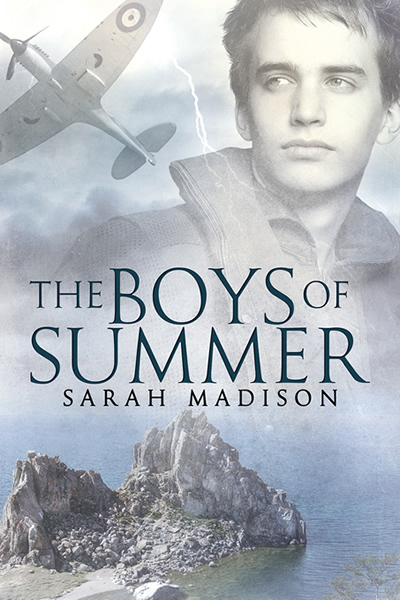 Sarah Madison recently posted..The Boys of Summer Now Available! I know it’s been tough to find & claim time & energy for writing. From my POV, TBoS proves the struggle is worth it! You don’t know how delighted (and relieved!) I am to hear you say that! 🙂 I knew I was taking a big chance by including such a long and detailed dream sequence and that it wouldn’t work for everyone. I’m just so glad you *got* it and understood what I was trying to do here! That just makes my whole day–thank you! Sarah Madison recently posted..When did I become one of Those People? Oh, you don’t know how happy it makes me to hear that you’re a fan! Seriously, blushing here now! Thank you! EEE!!! I’m so happy to get this. It’s wonderful! So, I mainlined it yesterday at work (Thanks Amazon Cloud!) while I was supposed to be, you know, working. What a beautiful, gut-wrenching story. Am I allowed to have my own personal fanon, though? In my head, the whole lyrical dream interlude (sobs) they both had, read to me as Fate’s way of slapping them upside the head. That they really did live back then, the war separated them through death, but now have a second chance to be together. Also, the camp they found after crashing was where WWII David ended up at (dying there) and the identity disc they found was WWII Rick’s, that David kept. I’ll stop rambling now. What a gorgeous story, and so very vivid. It kept startling me when I looked out the windows at work, and it was overcast, dark, and rainy. You don’t know how this made me grin on my own rainy afternoon here today. And I love that you have your own head canon because that’s what my favorite stories do for me! I start thinking about other ways in which things could have turned out. That’s so cool! Oh gosh, reading about your head canon made me tear up a bit again. Isn’t it an amazing dream sequence?!? It’s either an amazing dream sequence, or a heartbreaking reality. Depends on if we want to sigh, or cry. Either way, I totally agree with you. I’m horribly behind with my reading, but this is most definitely going on my ‘to be read as a priority’ list. The story sounds intriguing, not least because WWII military aviation history is one of my passions, and the cover is quite simply exquisite. I’m so looking forward to reading this! Sarah Granger recently posted..It’s a risky business, this writing malarkey. The cover is gorgeous, isn’t it? I am thrilled with it! Oh, I so hope you like this story–when I wrote the prolonged ‘dream sequence’, I knew I was taking a major risk here, and that it wouldn’t work for everyone. But after researching the era, and in particular, the Battle of Britain, I just couldn’t use what I’d garnered as a simple one-off for the protagonist–I felt like I had to do justice to the period. That just wasn’t possible in a single scene. When you get around to reading it, please do come back and tell me what you think–I would love hearing the opinion of a history buff!